ENTER TO WIN A TRIP TO VIVA LAS VEGAS! 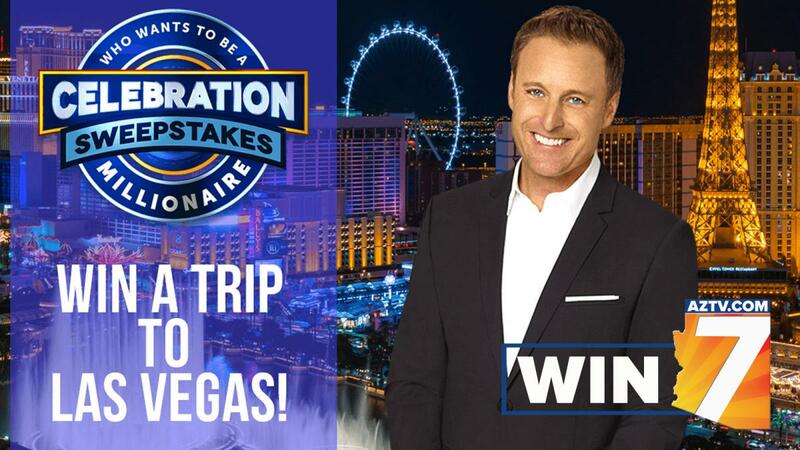 From January 28, 2019 – February 8, 2019 enter daily for your chance to win a trip to Las Vegas and attend a live taping of Who Wants to be a Millionaire? with host Chris Harrison! Enter each day during the Sweepstakes window (January 28, 2019 – February 8, 2019) to increase your chances to win. Starting Monday, January 28th, watch Who Wants to be a Millionaire at 5p & 5:30p for the code word and enter at aztv.com/win for your chance to win. Contest ends Friday, February 8that 11:59p. All winners will be randomly selected by KAZT contest software. Grand Prize winner will be drawn after the close of the contest signup period and notified via email or phone. Grand Prize winner will be announced on Monday, February 11th, 2019 during the Arizona Daily Mix beginning at 8a. Prize is subject to the Who Wants to be a Millionaire taping schedule. Winner has 7 days to claim their prize and must present photo identification. Prize must be used in a single visit. All guests must be age 18 or older. Hotel accommodations include complimentary hotel room rate, hotel room tax and Resort Fee for three consecutive days and two nights for winner and one guest sharing a hotel guest room of hotel’s choice. In the unlikely event that the selected property becomes unavailable during the confirmed dates, KAZT & Disney ABC Home Entertainment will have the right to substitute a hotel of its choosing that is of similar value. At check-in, guests must present a valid U.S. driver’s license or passport as proof of identification, and a major credit card to guarantee incidental charges applied to the hotel folio. Prize must be redeemed and travel completed between January 1 - August 30 of 2019. Disney ABC Home Entertainment will coordinate all travel plans. Grand Prize Winner and guest are responsible for booking their own travel arrangements to and from Las Vegas, NV. AZTV is not responsible for any delays, cancellations, or force majeure events (as understood in the travel industry) that delay or result in cancellation of all travel.